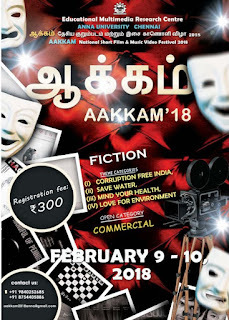 Educational Multimedia Research Centre, Anna University Chennai is organising AAKKAM National Short Film & Music Video Festival 2018.
other National Language. Otherwise, their participation will not be considered. AAKAM National Short Film Festival will be held in February 2018 at Anna University. • The film cannot be a reduced or extended version of another short film made previously for this festival. The AAKAM National Short Film Festival will award honorable mentions if the jury deems so. The prizes are personal and not transferable. The AAKAM National Short Film Festival organization can deem some categories as deserted if the call does not meet a minimal participation.